Find out more about antique clock values. From a miniature lantern clock by George Clark measuring only six inches to the top of its tiny finial to an elaborately carved walnut Chippendale tall-case clock with the dial signed by Jacob Godschalk, rare antique clocks come in all shapes, sizes and designs. Many fine antique clocks grace the shelves and walls of clock collectors throughout the world. Each one can be a magnificent example of a timepiece of years past. Yet only a relatively small percentage of clock collectors' ever have the opportunity to add a rare or important antique clock to their collection. Most of the known surviving clocks made during the 1500s through the 1700s are housed in museums and the remaining ones belong to private collections. Although there are times when a piece from a collection, or an entire collection, is put up for sale or auction, the prices realized for these rare clocks is often $50,000 to $100,000 or more. Although there are many clocks from the 1800s through the early part of the 1900s which are commonly found in today's antique marketplace, rare or important clocks from these years still command a high price. The following antique clocks are among the rare clocks sold at Christie's Auction House during the past several years. Both clocks sold at far above their estimated values. A rare Imperial Chinese ormolu, enamel and paste-set clock from the Guasgzhou Workshops of the Quinlong Period has musical and automated singing birds and strikes on the quarter hour. 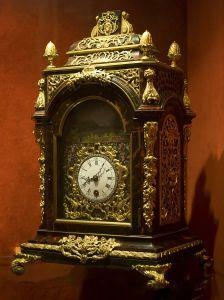 From the late 1700s, the clock had an estimated value of $579,371 to $836,869 and a realized price of $4,078,276. An exquisite example of a rare tall-case clock is the Chippendale with the dial signed by Jacob Godschalk. The grandfather clock, made in Philadelphia between 1765 and 1775, stands more than eight feet tall and had an estimated value of $150,000 to $250,000. The clock sold for $800,000. An elaborately carved large walnut Swiss Black Forest hunting wall clock, circa 1870, has carved details that include a pair of pheasants, a bird's nest, branches and leaves. The second rare clock from Albert's Antique Clocks is the sixth clock on the page. Although the clock looks like an ordinary Waterbury Tambour clock, circa 1920, the feature that makes this clock rare is the fact that it has two complete clock movements. The Westminster chime and the hourly strike are controlled by the upper clock movement and the running of the clock is controlled by the lower clock movement. A gorgeous hallmarked silver and tortoiseshell humpback carriage clock, circa 1919, was sold in London by Mappin and Webb.